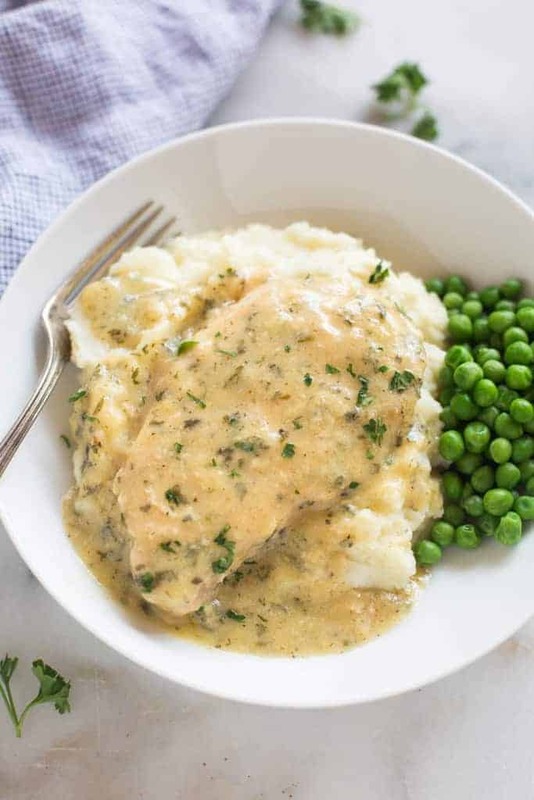 Slow Cooker Creamy Ranch Pork Chops is another fix-it and forget it, favorite dinner of ours. Super tender pork chops cooked in a delicious, creamy, homemade ranch-style gravy. Serve over mashed potatoes or rice, with a side of steamed veggies. Hooray for Slow Cooker recipes! They just make life easier. Period. Especially if you have a family and the weeknights are super busy. I think one of my favorite crock pot dinners of all time are Slow Cooker BBQ Ribs . I made them forever in the oven, followed by the BBQ, but they were never nearly as tender as when I started cooking them in the crock pot. Game changer. I also love these Slow Cooker Chicken Tacos for busy weeknights. My kids will always eat tacos. They’ll pretty much eat anything that’s wrapped in a tortilla. 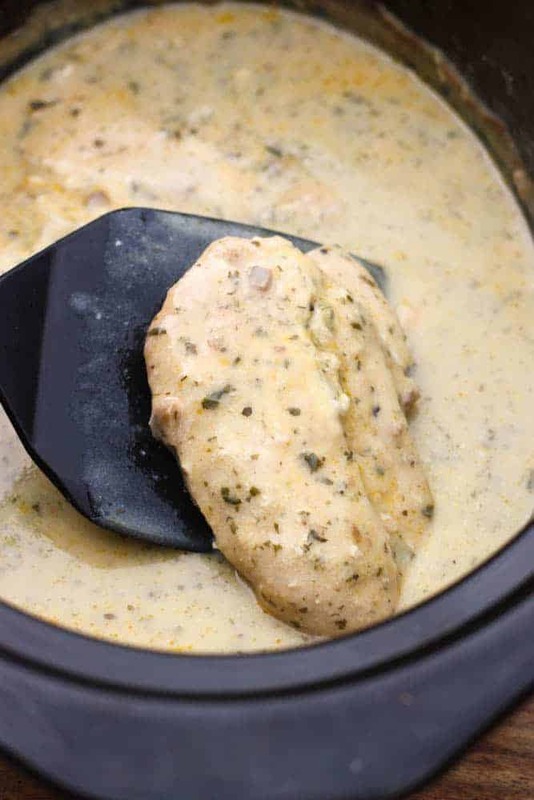 This slow cooker creamy ranch pork chops recipe makes a regular appearance in our Sunday dinner rotation. It the perfect comforting, warm dinner that you can throw together in the morning and enjoy whenever you’re ready — especially if you have a crock-pot like mine, where it turns to “warm” once the timer goes off. That way I don’t have to worry whether I’m home or not when dinner is done. Similar ranch pork chop recipes you may find online call for a packet of ranch seasoning. My version makes the “ranch seasoning packet” from scratch. I love using real spices from my pantry whenever I can, verses the packaged stuff. You’ll also notice that the recipe calls for cans of cream of chicken and cream of mushroom soup. I would highly suggest making a double batch of my homemade condensed cream of anything soup recipe. The flavor of the homemade sauce is really incomparable to what you get from the can, and it literally takes 5 minutes to make. If you in the hurry, the canned stuff works too. 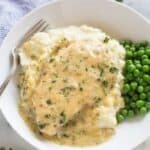 This is one of those slow cooker meals that has my family literally licking their plates clean. It’s one of the few meals that my three-year-old actually asks for seconds. We like to serve it with mashed potatoes or over rice pilaf or quinoa. It’s delicious! 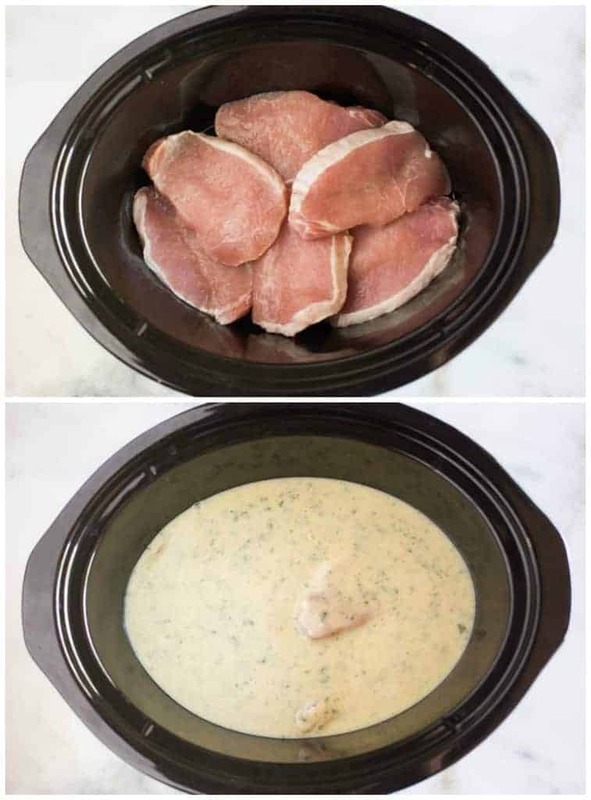 Slow Cooker Creamy Ranch Pork Chops with NO PACKET seasoning. The easiest slow cooker pork recipe, made from scratch. A family favorite! Spray your slow cooker with non-stick cooking spray and place pork chops on the bottom. Mix together the remaining ingredients and pour over the pork chops. Serve with a veggie, like these 5-minute Shredded Brussels Sprouts or these Roasted Vegetables. I originally shared this post November 2015. Updated February 2018.